So you were at the dentist this week, and they told you that you (or one of your kids) needs braces. All you can think about is having a mouthful of metal and a dent in your bank account. We understand! At our nine orthodontist offices in Greater Boston and Cape Cod, we talk with people of all ages and stages of life about the many oral and overall health benefits of getting orthodontic treatment. All too often, patients think that seeing the orthodontist or having braces is more optional or that it is a luxury and not something that they necessarily need to worry about unless they simply want a straighter smile that’s more appealing. Your ARCH orthodontist will tell you that investing in your smile is something everyone with crooked teeth or jaw misalignment should consider. 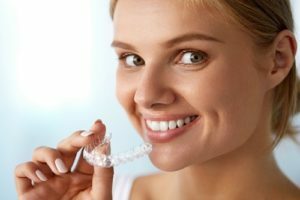 While having a beautiful, confident smile is definitely a bonus a huge reason why having braces is so great, there’s more to straightening than you might think. Sometimes when you have crooked teeth, you’re more susceptible to cavities and decay because it’s easy for bacteria to build up in between your teeth – even if you’re excellent about brushing and flossing at home. Your orthodontist and your dentist will always tell you that it’s important to keep your natural teeth as healthy as possible for as long as possible. While there have been so many advancements in dentistry over the years, nothing is more effective as your natural teeth. If you’re a parent considering braces for your child, this is important to keep in mind. Allowing them to live with crooked teeth could lead to trouble when they’re older. If you’re an adult facing braces, you’ll want to think about the same thing. You need to do everything you can to keep tooth decay and gum disease out of your mouth to avoid tooth loss later in life. When your teeth misaligned, it can affect your bite and even how you speak. By using braces to straighten your smile, you have the chance to enjoy an enhanced quality of life that’s free from the pain and discomfort that can sometimes be associated with misaligned teeth or a bad bite. When your bite is right, you’ll feel better and be less prone to common side effects such as headaches, ear pain, and jaw discomfort. Now that you know about the added benefits of getting braces for your smile or your child’s smile, it’s time to think about what type of orthodontic treatment you can use to straighten your teeth. ARCH Orthodontics in Greater Boston and Cape Cod has numerous options that you should take into consideration. We offer everything from traditional metal braces and ceramic options to life-changing Invisalign clear aligners to straighten your smile more discreetly. If you have questions about proceeding with your orthodontic treatment or about how you can help your child’s smile, please don’t hesitate to give ARCH Orthodontics a call. We have offices in Brockton, Stoughton, Bridgewater, Canton, Hyannis, Hyde Park, Orleans, Randolph, and Westwood.